Jungle Red Writers: Happy St. Patrick's Day! Jenn McKinlay: Being Irish, there is so much that I love about St. Patrick's Day. 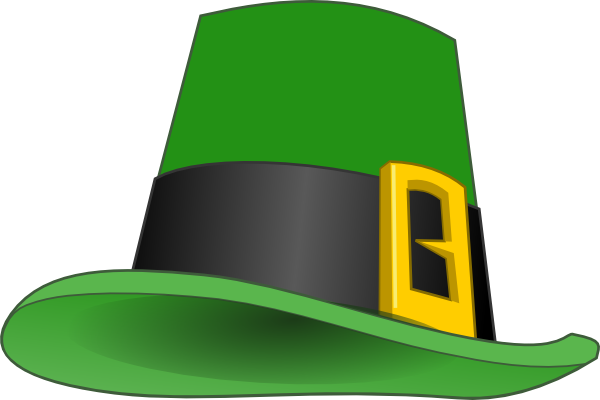 The parades, wearing green (it's a favorite color), corned beef and boiled potatoes, the parties, and even the green beer. Seriously, how can you be glum when you're chugging green beer? It's GREEN! 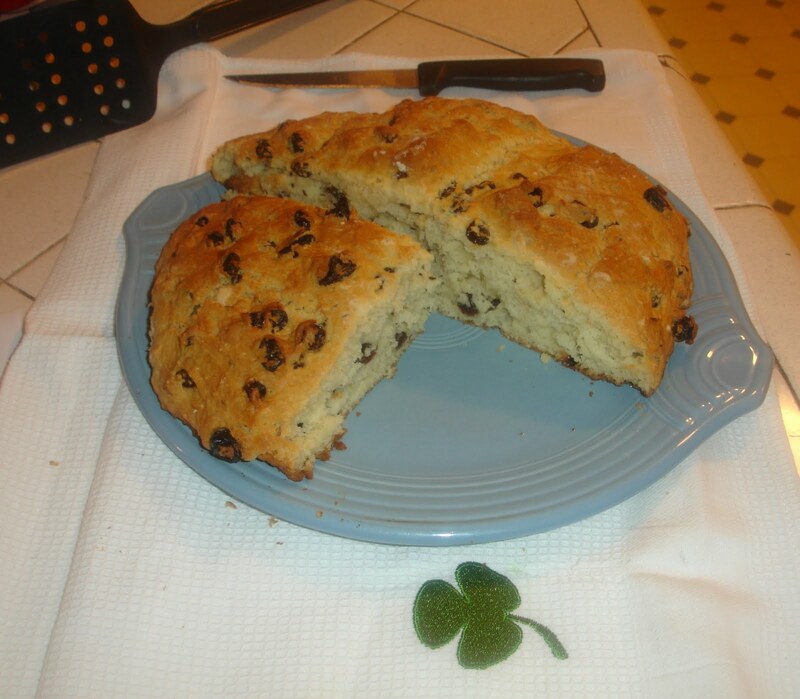 While I do love my corned beef, boiled potatoes, and green beer, my favorite thing to cook on St. Paddy's Day is Irish soda bread. It has a fascinating history. Introduced in the 1800's, it was meant for people who didn't have ovens (not many did back in the day). Can you imagine? The bread with a baking soda base was cooked in a cast iron pot with a lid by putting it right on top of the hot coals. Because it was made with baking soda it was not as perishable as regular bread. A friend gave me this recipe about eight years ago, and I have made it every St. Patrick's Day since, because...Yum! knocking off excess flour. Whisk together first five ingredients. less sticky dough. Pat into a domed 6-inch round on baking sheet. My good luck pursue you each morning and night. What about you, Reds and Readers, what do you love about St. Patrick's Day? Thanks for the recipe . . . I’ll have to try this. My Irish soda bread recipe is similar but does not have caraway seeds. I generally bake round loaves of bread on a baking stone . . . that would work okay for your recipe??? What do I love about Saint Patrick’s Day? Family getting together . . . the food . . . the parades . . . wearing green . . . I think I've got to have a baking stone Joan! I definitely have to try it on a baking stone. I've never made soda bread, so I'll have to try your recipe. Sounds yummy! When I was a little girl we lived in a college town that celebrated St. Patrick's Day with a big, rowdy parade, often featuring the Budweiser Clydesdales. I was horse-crazy back then, so I loved that parade, although "Don't talk to men with green faces" was serious parental advice. These days it's got to be the music. Two of my friends are in Irish bands, and a couple of my musical heroes are Patrick Ball and Alasdair Fraiser. If that kind of music doesn't lift your heart and make you want to get up and dance you may be beyond hope. So true about the music! The music is the best! I once spent St Patty's in New Orleans! Best one ever! I don't like green beer but today I'll be cooking corned beef with potatoes and onions in the crock pot. Yum yum! I've been off the green beer for a while :) but have so many great memories of it! I'm half Irish and half English, but my ex is from Dublin, so my father and my children are 1st generation, and I've been there many times. Despite all that, I'm not fond of corned beef and cabbage, beer (green or otherwise), or soda bread. (Yours looks lovely, though, Jenn; maybe it's the caraway seeds I don't like. I may try it without them.) I do like an occasional Guinness or Irish whiskey, and I really like the brown bread that's often used for toast over there. Nice with a fry for breakfast. Happy St. Paddy's day, everyone! I used to make it plain for the hooligans when they were young - they loved it. I live in Boston. If you are wise on St. Patrick’s Day, you hide. I mean seriously, stay home. :-). Never has there been so much public and conspicuous consumption of beer. It is craziness! Sort of like New Year's Eve every where else, I bet. I used to go to the New Haven Parade - so much fun! Thanks, Jenn, for the recipe. It looks like the best one I've seen and I can't wait to make it! Jenn, the soda bread looks amazing--I need to give it a try! My Irish ancestors arrived on the shores of Virginia in 1766, so we've been celebrating the Irish in America for a long time--what I like best is the music--and paying tribute to me Grandmother O'Bryan! I have Irish on both sides and the Hub does, too. Combined we're Ryan, Norris, and McCabe all from Country Cork, I believe. My Irish cousins Niall and Mary, have the best last name - Thunder. Not a drop of Irish blood here, more's the pity, but my red-haired oldest daughter has a good bit of Celtic ancestry on her dad's side. And both sons-in-law, as well. So St. Patrick's Day is a big deal to both of these daughters. I leave all the shenanigans to them. My oldest usually gets together with three girlfriends every year to celebrate together. One of them is 100% Irish, and they go green gaga. I'm celebrating today with pancakes and real maple syrup at the Nature Center! Jenn , I love your blessing and may try your soda bread. No many celebrations in rural Quebec but I always remember fondly my travel to Ireland on St Patrick day. I had joined a group of 44 americains being there because of their ancestors ( I don't have Irish ones but love Ireland ). I'll listen to my CD souvenir : The High Kings singning Irish folklore and maybe drink a Guinness. That sounds like a fun trip. Enjoy your Guinness, Danielle! I'm related to award-winning Irish dancers, one of whom runs an Irish dance school, and for many years I was drafted into volunteering at his annual feis. So you would think I celebrate St Patrick's Day in a big way, but I don't. I do wear green(of course! ), and I will most likely have corned beef later today. I have three or four Irish soda bread recipes. A couple of them look very much like yours, Jenn, but I don't make it anymore because a good friend from church gives me at least one loaf each year, and I get to enjoy it without having a messy kitchen! And there's not one drop of Irish blood in me! I love the Irish dancing! So festive :) Very smart way to keep the kitchen clean! In college, my friends used St. Patrick's Day as (another) reason to drink beer. I am not a big beer fan. Supposedly Pittsburgh has a huge parade, but I've never gone as I don't like crowds. The soda bread looks yummy! I was like those college friends, for sure ;) And I love a good parade. Hub is with you, however, he doesn't like crowds. Top of the morning to you all, me darlings. At this turbulent time the peace of Ireland and it's good hearted people seems very inviting! John is quarter Itish. Our little granddaughter, at least half Irish, danced in the st Patrick's Day parade. I can pass on the cabbage! I bet your granddaughter was adorable! We participate in a card club that gets together every other month, and honestly, it's more about the food than the cards. We meet tonight, so I spent an hour or so last evening searching for just the right Irish recipe. I finally settled on a variation of Irish Soda Bread that involves whole wheat flour, oatmeal, and a can of Guinness. I've never made it before, but it sure looks good! I really love that our club meets tonight because it satisfies that desire to be with people and have a little fun celebrating the day without being out among the drunken hordes. That sounds perfect. Do report back on the bread - made with Guinness? Sounds good to me! Susan, I’ve never seen a recipe for bread with Guinness, but we have tried Guinness macaroni and cheese [amazing]. And this year we tried a new recipe and cooked the corned beef [with potatoes, onions, carrots, cabbage] in the slow cooker with Guinness. Everyone raved; it was tender and flavorful, and very easy . . . . I have some Irish blood, although I need to do a DNA test to determine just how much! That said, I don't do much of anything to celebrate, although that soda bread recipe is tempting! And it's pretty easy for non-cooks. It does make a lot (2 loaves) so you might want to half it if you get tempted to give it a go. I love the "non-cook" part. "Bless ya, deah," as my Irish Catholic "aunt" from Boston used to say. Both of my father's parents were born in Ireland and came to the US as young adults so Irish blood dominates in my veins (Mom's family is primarily English and German). I'm hosting the family St. Pat's Day dinner tomorrow, in keeping with the family tradition of never celebrating a holiday on its actual date! We frequently delay a gathering until a day when everyone can make it. There will be beer but I know that none of it will be green. Luckily for me, my brother likes to do the corned beef and cabbage and his son has promised the Irish Soda bread so I have very little to do (my kind of holiday dinner!). That sounds lovely and I LOLed at your family tradition of not celebrating on the actual date. Definitely have some Irish in our background but not really big on celebrating. At least in recent years! My husband and I and our nextdoor neighbor plan to walk a couple of blocks over to the restaurant/bar area later this afternoon and have a drink in honor of the day. Erin go Bragh! Have fun! I make corned beef from scratch. The brisket has been brining for a week in a variety of spices, Guinness, and pink salt. AKA salt peter. Just put it in a slow oven. Later I’ll add the veggies. I’ll skip the parade although it’s a gorgeous day. It’s also a day of mourning in Rochester, having lost our dear Louise yesterday. Life goes on. Heaven has a new angel today, and I’m sure she’s getting things organized and some wrongs righted. Or lefted, if you please. So sorry for your loss, Ann. Hugs. Oh, Ann. I am so sorry. Thinking so much of you.. So sorry to hear this, Ann; thinking of you . . . . Feels like a personal loss but I’m referring to Congresswoman Louise Slaughter, my representative in this shambles of a government. She was an icon. May your troubles be less and your blessings be more.....and may nothing but happiness come through your door. Irish diplomacy--Telling someone to go to hell and have them looking forward to the trip! Jenn, that is a wonderful story about Irish soda bread. I love wearing green and on St. Patrick's Day, I wear green and look great! Green is a color that I can wear. And today I had a St. Patrick's Day cupcake. I put the photo in my Instagram stories today. I don't think I've ever had Irish soda bread. I know about it, but I just don't think I've eaten any. Your recipe sounds good, Jenn. I just love the whole St. Patrick's Day being a fun day. I like wearing green so no one will pinch me, and I like reading the lovely Irish blessings online. I'm not Irish, but my name was taken from the song "I'll Take You Home Again, Kathleen," so I feel a connection. I've had a day of going to my teenage granddaughter's high school play, Fiddler on the Roof, in which the teenagers putting it on were so awesome that I can't believe they are so young and sound so professional. Then it was college basketball, watching my team Kentucky win to go on to the Sweet Sixteen. Hope to read tonight. Happy St. Patrick's Day to all my dear friends here!